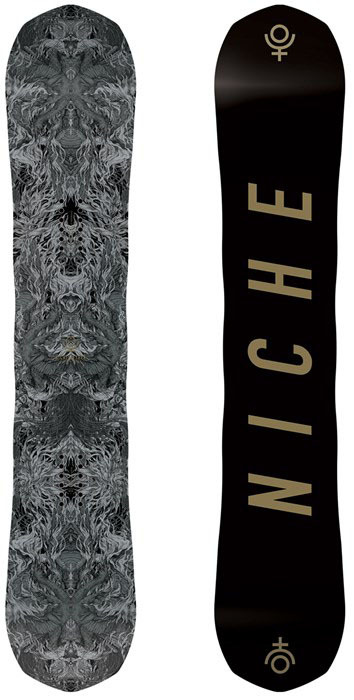 The Niche Aether takes a bit of the Story’s camber personality and puts it into a centered twin shape. Jimbo and Dave loved this side with their bigger feet but I would of prefered the next size down with my size 9 boots and then I think I would of had a lot more fun on it. We try to get as many images of the Niche Aether, but forgive us if they're not all there. Sick board! It does turn a little different than some of my other boards do to the mid wide ride of this whip. Having said that, it's super stable and plows through anything in your way. It is the best board I've ridden besides the TRS Pro.